Speed is a critical factor in all road crashes and casualties. Driving is unpredictable and if something unexpected happens on the road ahead – such as a child stepping out from between parked cars – it is a driver’s speed that will determine whether they can stop in time, and if they can’t stop, how hard they will hit. Hence reducing and managing traffic speeds is crucial to road safety. It has been estimated that for every 1mph reduction in average speeds, crash rates fall by an average of 5%. Breaking the speed limit or travelling too fast for conditions is recorded (by police at crash scenes) as a contributory factor in more than one in four (28%) fatal crashes in the UK. This is arguably a gross underestimate, because whether or not a vehicle is judged to have been speeding or going too fast for conditions, the fact it was involved in a collision means it was going too fast to have stopped in time. In this way, speed is always a contributory factor, albeit often in combination with other causes: no one was ever killed by a stationary vehicle. 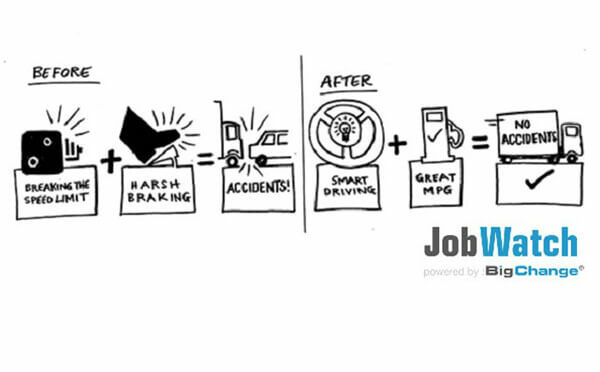 JobWatch powered by BigChange includes for free Driver Behaviour Reporting and Alerting. The system measures Speeding, Acceleration, Harsh Braking, Cornering and MPG. We promote praising safe driving and award our customers with cash donations made on their behalf to « Brake Road Safety Charity » . Well done to Exova PLC for promoting safe driving, Darren Leanning of Exova Grimsby won the BigChange Safe Driving Award last quarter.